Remember when I mentioned that I lost all my pictures from my other computer? Well this photo was one of the casualties, but luckily I was able to snag it from the A Muse Blog once it went up today – thanks Linda! 1) When you’re stamping your houses on the Petite Red Gingham paper, why waste precious time stamping out 100 images if you’re making 100 cards? 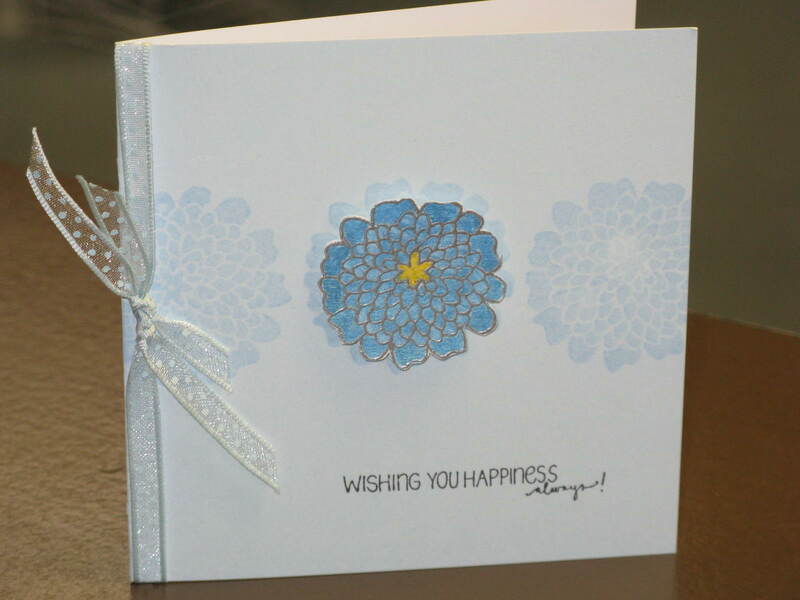 There’s five houses in that little row, so cut out a different house for every card – that way you only need to stamp 20 images on the gingham paper which can easily be done on one sheet of 8.5×11 paper with scraps to spare! 2) Use your white Signo Uni-ball pen (best white pen on the market!) to add a bit of snow to the eaves of the red gingham houses before applying glitter or cutting them out. 3) Use your Quickie Glue pen to add glitter to the eaves and to the snowbank below the houses, or use a wider chisel tip glue pen for the snowbank. Do this before adhering your little gingham house to avoid glitter build-up around the dimensional foam tape. 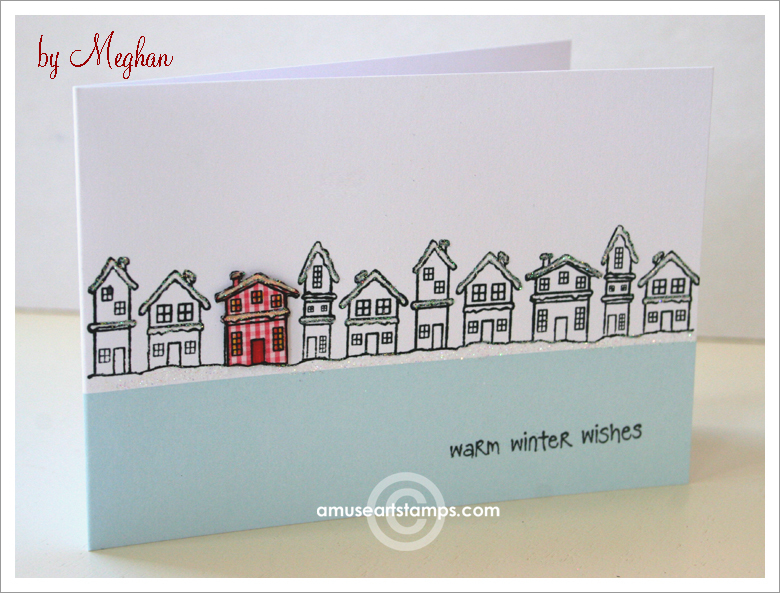 A Muse products: Winter houses, Winter wishes hand, Sky blue band 4-bar notecard, red petite gingham paper. 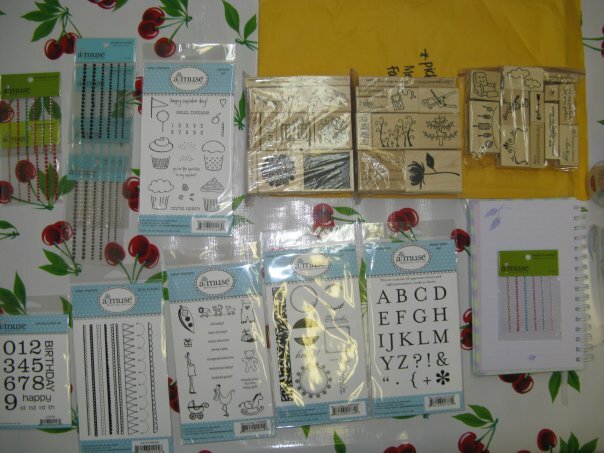 See those awesome Monogram frames (acrylic stamps)? Julie Ebersole designed those for A Muse, along with a few other stamps from the latest release – how cool is that?